AUT prepares students well for the changing world, says business alumnus Jeremiah Chia who came to AUT as an international student from Singapore. “The world is changing and the job market is too. Gone are the days when a degree guaranteed you a nice job and a fulfilling career. He always planned to further his education overseas, Jeremiah says. After deciding to study in New Zealand, Jeremiah carefully weighed up his study options. The people were one of the highlights of his time at AUT, Jeremiah says. For Jeremiah, the time at AUT was also the beginning of a new chapter in his life. 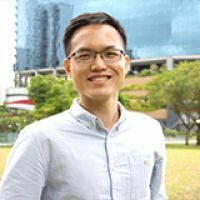 Since graduating in 2016, Jeremiah has returned to Singapore, where he had stints at a local charity and a global mid-tier accounting firm before co-founding JCK Singapore. “Our firm specialises in accounting and taxation advisory services, and setting up brand new accounting systems for our clients. We are certified advisors for both Xero and Quickbooks Online, and have also recently signed an agreement with Zoho Corporation, which has offices in India and the USA, and became Singapore's first Zoho Books Certified Advisor Firm. He enjoys the variety of his role, Jeremiah says.